Are you bird-watching in Costa Rica for the first time? Well, when you turn to the woodcreepers in your field guide you may get the same sinking feeling that I did when I first came here and say to yourself: How the devil am I going to sort these out? The recent trip to the Caribbean coast raised questions again, mostly perhaps because we were unsure which of Costa Rica’s 16 species were most likely to be encountered. The field guides make clear that there are 7 of these that can be excluded on the grounds of the normal range of their distribution in the country. Of the remaining 9 the Wedge-billed Woodcreeper (no streaks) does not present any identification difficulty, chiefly because of its short bill, while the bill of the Brown-billed Scythebill also makes it virtually unmistakable. We actually encountered neither of these on the trip. 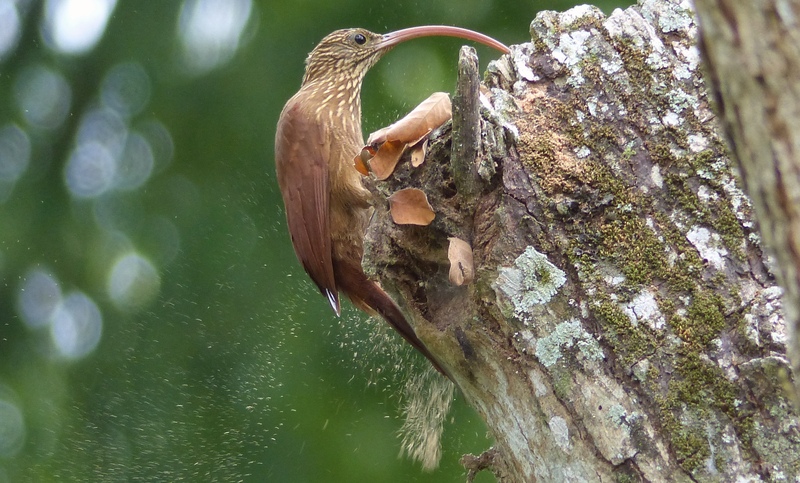 The loud, strident call of the Cocoa Woodcreeper distinguishes it immediately from the descending trill of the Streak-headed, but if you hear no call you need a good look at the bill of each species to safely distinguish. We also noted that the Cocoa tends to be more placid and not to flutter around as much as the Streak-headed. The generally dark environment of woodcreepers and the muted colour of their plumage may still make identification a problem. We found this to our cost in the case of the final species, the Northern Barred-Woodcreeper (Dendrocolaptes sanctithomae). Because of poor light and the difficulty in judging size we had a hard time pinning down this one at first. I hope this brief post brings some clarity and not confusion to a generally bewildering family of birds. Great photos and post! It’s always interesting to see what’s common there, and if there are slight differences… Your birds in this post look just like the ones here… The streaks on the Streak-headed make me think of slivers of almonds! The Plain-brown and the Streak Headed often ‘drop in’ to inspect the trees near my home. Every so often the Red-billed Scythebill allows a brief viewing option…. The Mindo area has many more species, but I’m happy with these three, as well as the Olivaceous, which dropped in this morning for a quick visit. We have the Olivaceous but not your scythebill. I’ll check it on the internet. Many thanks! i also loved your post about the puff birds… So far the White-necked and the Barred are the two that seem quite comfortable with my gawking skyward and sending greetings! What a beautiful photo of the scythebill! Many many thanks!